Feedback is a fundamental tool of effective teaching and is a skill that, though easily learned, takes a lifetime to master. Giving and receiving feedback across racial, ethnic, gender, LGBT identity and other power differences adds complexity to this process. 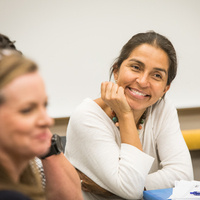 The UCSF Differences Matter initiative has made clear the importance of faculty competence in fostering a positive learning climate for all: we have a moral obligation to provide equitable teaching and mentoring. Participants will learn and practice these advanced skills in the workshop, specifically focusing on challenging cases of their own. Define and diagnose stereotype threat in both learners and faculty in case presentations. Recognize and apply strategies in giving feedback that mitigate the effects of stereotype threat, including affirmation, high standards, empathy, acknowledging historical disparities, and acknowledging personal and system limitations. Define and apply strategies that improve identity safety in giving and receiving feedback. Recognize and overcome personal obstacles, including implicit bias, to giving and receiving feedback across differences. Use newly-identified feedback skills in challenging real-life scenarios that include differences across race, ethnicity, gender and LGBT identity. Set personal goals for applying the skills learned in this workshop to one's own practice setting, and review a tool designed to assess performance of new teaching skills. Practice simulations, using real cases of giving reinforcing and corrective feedback across differences. Reflect on how their own identities affect giving and receiving feedback. Review representative literature on feedback across differences in medical education. Discuss past experiences in successful and unsuccessful attempts to give high quality feedback across differences. Review a formalized structure for giving feedback. Discuss how avoiding giving feedback across differences perpetuates disparities in medical education.